Social media and the web have become the go-to for real-time information when disasters strike. 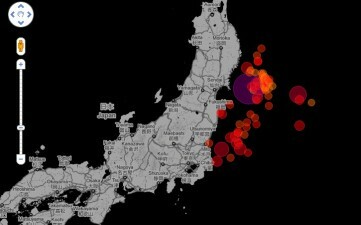 It’s no surprise that the news of Friday’s 8.9-magnitude earthquake in Japan spread rapidly on Twitter, while live video feeds and blogs kept pace. With unreliable cellphone service, social media is the only form of communication consistently available to people in Japan, says Brian Gillespie of Texas. He has reached out to friends in Japan through Twitter and Facebook. Mixi, Japan’s largest social networking site, has also been used to located loved ones, he says. Like Gillespie’s friends, many in Japan are updating us on the country’s status via the Internet. In addition, thousands of reporters and citizen journalists worldwide are distributing their knowledge of the situation on homepages and social streams. Now, hours after the initial quake, information about the earthquake and tsunami abound. Here’s a list of some of the best Japan earthquake resources online, as suggested by our readers. What tools are you using to track the crisis? Let us know in the comments which ones we’ve missed.